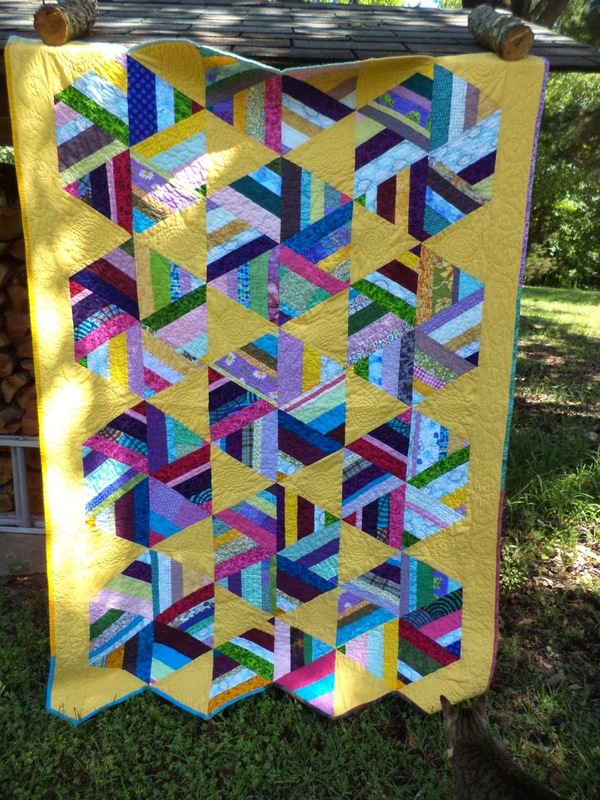 My string quilt craze started back in about October. I know this will not be my last string quilt by a long shot, but I can now finally say that 4 quilts later I have curtailed my overflowing strings bin. String quilt No. 1 was a very traditional blue and brown one, string quilt No. 2 was a more modern, bright, braid design, string quilt No. 3 was a super modern black/white/red quilt. And now we have string quilt No. 4, made from the leftovers of No. 2, arranged in a different design. My tutorial for these 60 degree string triangles can be found here. Turned another way theses could have been a spider web quilt, but I opted for a pinwheel instead. I really love the mellow yellow solid I found to set off the bright strings. I had a little fun with the FMQ. Spirals in the yellow triangles, stipple in the hexes, and waves in the borders. 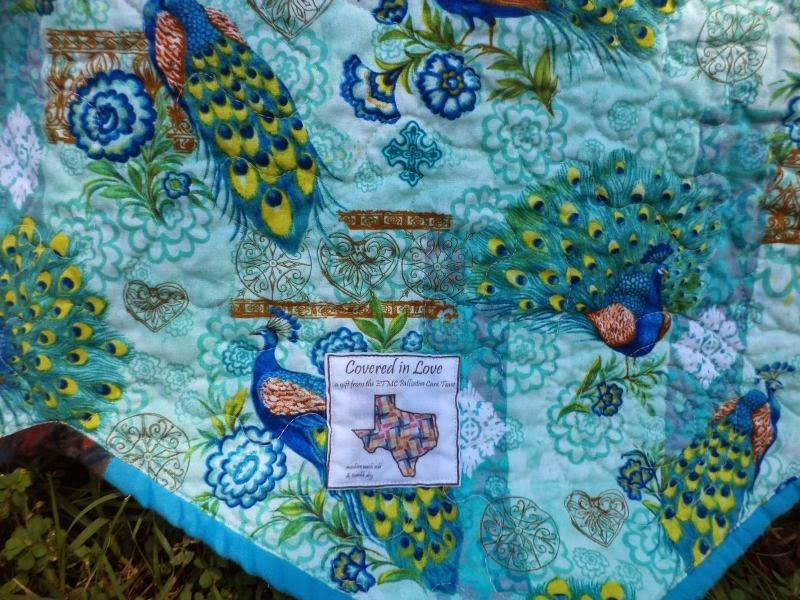 The dense quilting makes for lovely krinkle and a soft look. Binding is scrappy, which was only fitting. The backing is mostly this pretty, rich peacock fabrics, and yes, this is another quilt for Covered in Love. Thanks for visting!! Linking to Crazy Mom Quilts Finish it Friday and Oh Scrap at Quilting is more fun than housework. I love the vibrant yellow background! 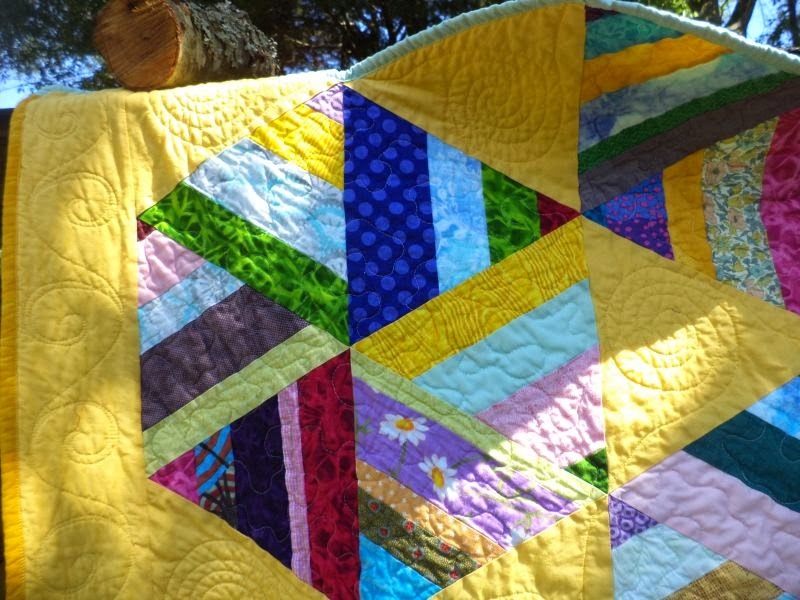 I too think the yellow was a great choice to set those pretty triangles off. And your quilting is lovely. Thanks for sharing with Oh Scrap! Beautiful! 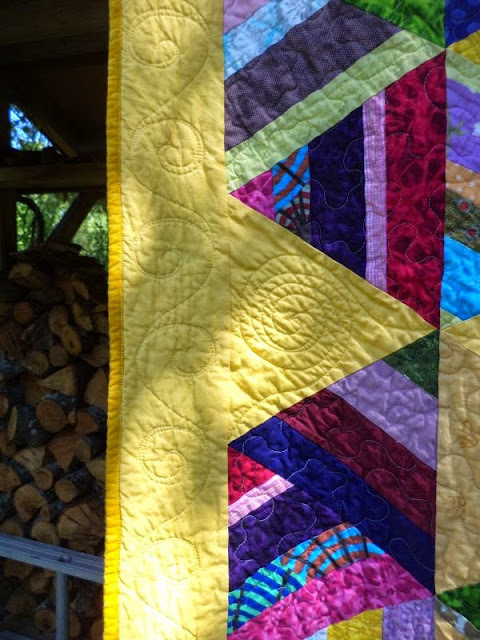 I have not tried a string quilt yet, but I'm inspired by yours! I'm visiting from Oh Scrap! I love strings too and have made so many blocks. Now I just need to put them together into something. I like your triangle idea. It turned out so pretty!